Frequently Asked Questions: Do Braces Hurt? October is National Orthodontic Month, so we are answering the questions we hear from patients. A question that we hear every single day from our patients at Glander Rochford Orthodontics? While a simple question, the answer is a little more complex and has a few answers. As the teeth start to move, which can happen as soon as the day your braces are put on, the patient may notice some discomfort or soreness. Kind of like a sore muscle after a hard workout or trying a new type of activity. This is a normal part of moving the teeth and can be alleviated by taking whatever you or the patient would normally take for a headache, or other minor aches. Another source of discomfort in those first few days of having braces can come from the brackets rubbing against the cheeks. Your mouth has something brand new inside it, and needs a little adjustment period. All of our patients go home with some wax to put on any bracket that may cause any discomfort. As the cheeks get used to the braces, the sore spots will begin to go away. The time it takes for your mouth to get used to the braces is different for every person. It is very important to us that our patients have an enjoyable experience while they are in treatment at Glander Rochford Orthodontics. While there will be some parts of the process that are less fun than others, the end result of a smile you can show the world with confidence is more than worth it! Please let us know if you are having any issues with your braces above and beyond what was described here and we will be happy to help you out. Still need to schedule your complimentary consultation? Visit this page on our site to schedule! 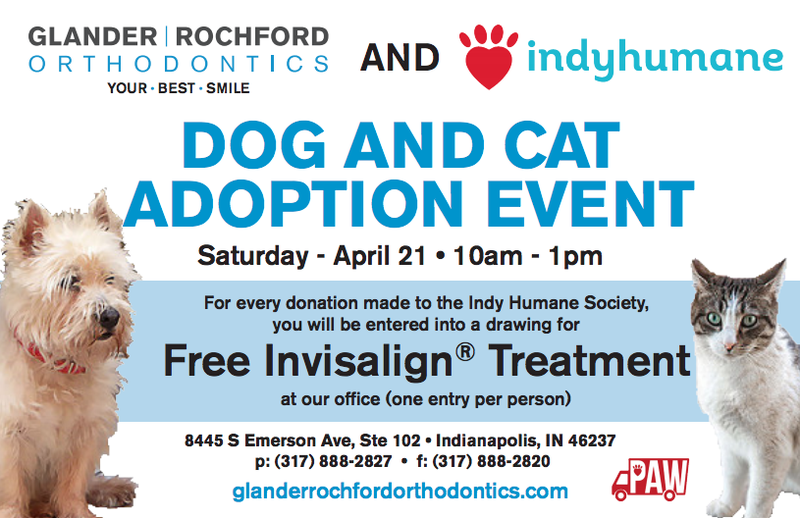 Announcing Glander Rochford Orthodontics Hosting the Pet Adoption Wagon from the Humane Society of Indianapolis! Glander Rochford Orthodontics is partnering with The Humane Society of Indianapolis and the Pet Adoption Wagon to host a pet adoption event! Saturday, April 21 from 10am-1pm, everyone is invited to come to the Glander Rochford Orthodontics practice to meet your new furry family member. If you decide to rescue an animal that day - you will be entered into a drawing for a FREE Invisalign treatment! In addition to helping adorable dogs and cats find new loving homes, we will also be accepting donations for The Humane Society of Indianapolis - and as a thank you, anyone who makes a donation will also be entered in for a drawing to win FREE Invisalign treatment. This event can be found on the Glander Rochford Orthodontics facebook page.